John A. Martin & Associates, Inc. Castellated Beams at Emerson College Los Angeles - John A. Martin & Associates, Inc. This month marked a milestone in the construction of the new Emerson College Los Angeles Center; the final construction beam was set on July 17th and activity is quickening in anticipation of the project’s January 2014 opening. 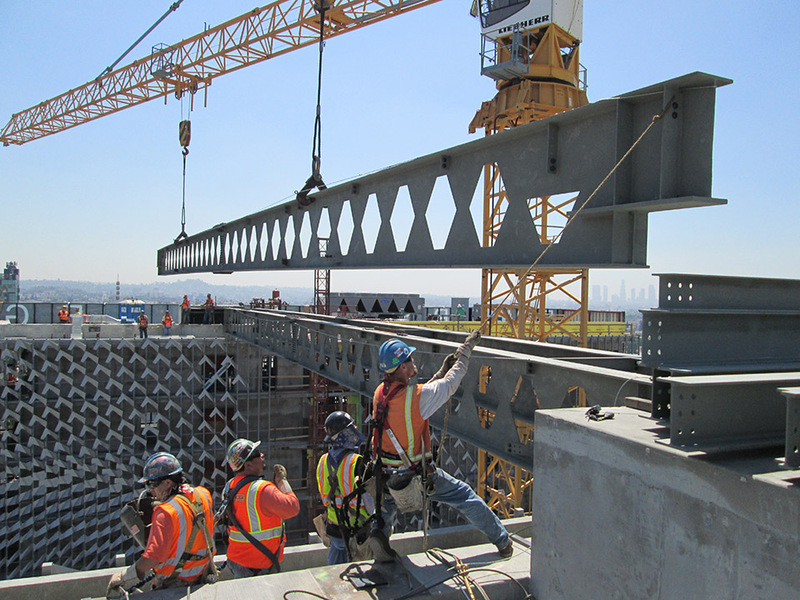 Part of the final construction assembly included eleven 120’ castellated beams (a type of expanded beam) on the north side of the structure. The castellated beams at Emerson serve a dual purpose: to provide support for a rooftop helipad, and to act as a structural diaphragm connecting the project’s dual towers at the roof level. These unique types of structural elements start with a wide flange beam, pattern cut in half longitudinally. The two halves are separated, staggered, and welded together to form a castellated beam. This new component weighs the same as the original, but is 30%-50% stronger and 50% deeper, adding structural load capacity and stiffness without the weight and added material.